Assoc. 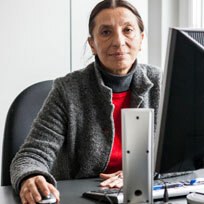 Prof. Valentina Ganeva-Marazova, PhD, has been a full-time lecturer in Arts Studies at NBU since 2010. Since July 2013 she has been Chair of the Department of Arts Studies and History of Culture and since July 2009 she has also been Head of the NBU Museum. In 1981 she graduated from Humboldt University in Berlin with a degree in Arts Studies. In 2005 she was awarded a PhD degree for her ‘Total Work of Art. The Modern and Traditional in the Works of Johannes Itten ’ thesis. In 1981-2011 she successively worked as a research assistant, research associate, and senior researcher II degree at the Institute of Arts Studies (the Bulgarian Academy of Science). She obtained her habilitation in 2010. Between 1997-2010 she was a part-time lecturer in the History of Arts Department at NBU, and since 2004 up to the present moment has been a lecturer at the National Art Academy in Sofia as well. Assoc. Prof. Ganeva-Marazova is an editor of the ‘Problems of Art’ Journal published by the Institute of Arts Studies at the Bulgarian Academy of Science (1992–2004), a member of the editorial board of MAF (Myth, Art, Folklore)- a publication of History of Arts Department at NBU, a member of the editorial board of ‘Cultural Heritage Studies’ Journal published by the NBU Museum, and a member of ICOM (The International Council of Museums). Her academic research interests include Art and Culture of European Avant-Garde in the beginning of 20th century, museology, anthropological methods and approaches in Arts Studies. • an administrative director of the national research project „Lemuséeestmort? Vivelemusée!” (‘Network of Museums’ scientific and educational infrastructure). It is a part of a bigger project - “Study of national historic and culture legacy as a part of European culture heritage and advanced methods for preserving” whose project leader is T. Shalaganova. • a coordinator of educational activities in the national research project INZ01/0114 ‘Heterotopy and Natural Resources’, Contract DO02-79/12.12.2008, Ministry of Education competition ‘Integrated scientific centres in universities’. • a head of the Bulgarian research unit in the international project ‘Eurovision- Museums Exhibiting Europe (ЕМЕЕ)’, funded by the Culture of EU Programme (2012- 2016), with Prof. Dr. Susanne Popp (University of Augsburg, Department for History Didactics) as a project coordinator and Paris-EstCréteil University, France,Università Degli Studi Roma Tre , Italy, National Museum of History, Bulgaria, National Archaeological Museum (Lisbon, Portugal), National Museum of Modern History (Ljubljana, Slovenia), Monochrome Arts Association (Vienna, Austria) and Atelier Brückner GmbH run by Prof. Uwe R. Brückner as project partners. Assoc. Prof. Ganeva-Marazova is an author of numerous academic publications, among which are ‘The Total Work of Art. Monographs’, MAF 4, Sofia, 2006; ‘Color and Sound I’ and ‘Color and Sound II’, published by Vezni Journal, ‘The Space of Ritual. Bauhaus’, ‘The Mask of Avant-Garde. The Mysterious Mask of Giorgio di Chirico’, ‘The Typeface’ Pictures in Avant-Garde’, ‘Self-Portraits and Masks in Modern Art’, ‘The Bach Singer’, ‘Ritual and Mask in Avant-Garde’, ‘Ring, Circle, Wreath’ , ‘The Concept of Time in the Bauhaus Rituals’, ‘Clownery in the Bulgarian Art from the ‘60s and ‘70s of the 20th Century’, ‘Curiosity Towards the Ritual Represented in the Bulgarian Art from the ‘70s of the 20th Century’, ‘Mask and Masquerade in Bulgarian Paintings from the ‘60s and ‘70s of the 20th Century’. TheMags - Digital Creative Laboratory Copyright © 2019 НБУ. All rights reserved.